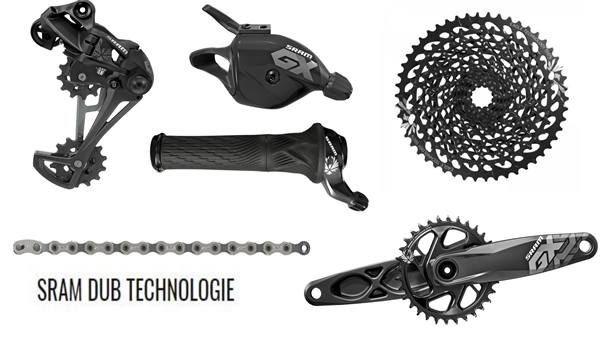 Product information "SRAM Groupset GX Eagle - DUB 1x12-speed - black - Boost"
The SRAM GX Eagle™ crankset delivers consistent performance every time out. Featuring SRAM's X-SYNC™2 tooth profile chainring, the GX crankset is engineered for complete chain control. Each tooth's thickness is precisely toleranced and controlled to work seamlessly with the chain's inner and outer links. Related links to "SRAM Groupset GX Eagle - DUB 1x12-speed - black - Boost"
Customer evaluation for "SRAM Groupset GX Eagle - DUB 1x12-speed - black - Boost"